Did Trump Leak His Own Tax Returns? Don't Put It Past Him. 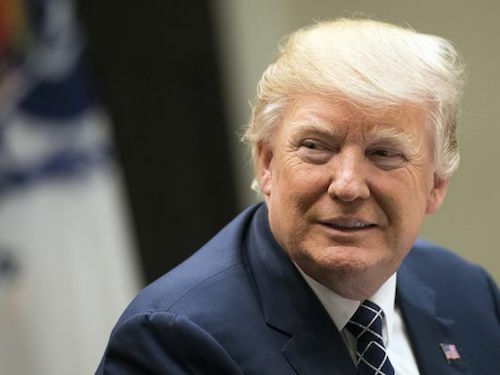 Two pages of Donald Trump's tax returns were revealed to MSNBC viewers last night, showing the president and his wife paid $36.5 million in taxes on income of about $153 million in 2005. The favourable length, timing and contents of the documents make it likely that Trump, or one of his supporters, were behind the leak. The brevity of the documents means they provide minimal insight into the structure and dealings of Trump's businesses. For many, the goal of pressuring Trump into releasing his tax returns is not to shame him for being less wealthy than he claims or for minimising his tax bill. Instead, it's to find out the full scope of his global business interests and understand his ties to foreign politicians and businessmen, as those factors may well colour his decisions as president. The pair of pages released only serve to flatter the president and reinforce the conservative narrative that liberals are fussing over nothing. The leak comes at a serendipitous moment for the embattled president. His plan to repeal and replace the Affordable Care Act, or Obamacare, has provoked widespread criticism. He continues to battle claims that his campaign conspired with the Russian government, and that the latter are using 'kompramat' - compromising materials - to blackmail him. Indeed, several members of his inner circle have failed to disclose calls and meetings with Russian officials, even under oath. Moreover, Trump's first travel ban was swiftly suspended by a federal judge, and the follow-up looks set to face similar legal challenges. He recently accused his predecessor, Barack Obama, of monitoring his communications during the campaign, but has failed to provide any proof. Then there are his absurd claims that millions of people voted illegally in the US election and that his inauguration ceremony drew a record crowd. And the incessant leaks spilling out of the White House have reportedly created an atmosphere of hostility and paranoia. The latest one has shifted public and press attention away from Trump's troubles. The contents of the tax returns are so positive and innocuous, someone opposed to Trump would have no motive to release them. They show Trump paid a hefty 24% tax rate - although most of that was due to alternative minimum tax (AMT), a tax targeting the wealthy that Trump intends to eliminate. In contrast, he reported a loss of more than $900 million in 1995, which could have spared him from paying taxes for the next 18 years, according to The New York Times. The pages also date back to 2005, revealing little about the president's current finances. And they're stamped 'client copy', suggesting they're from the president's file cabinet rather than the Internal Revenue Service (IRS). The White House accused MSNBC of breaking the law and being "desperate for ratings". 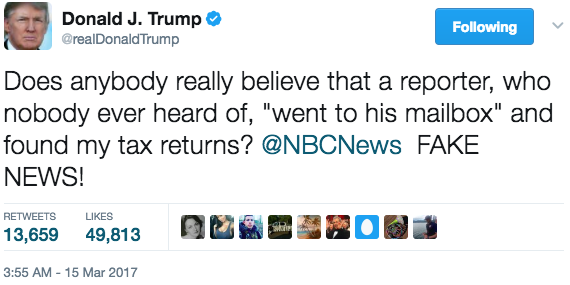 Meanwhile, Trump expressed his indignation and implied the tax returns were stolen in an early morning tweet. Unsurprisingly, he accused MSNBC of publishing "FAKE NEWS", even though the White House confirmed the information was correct. And although the reporter who received the tax returns, David Cay Johnston, has interviewed Trump and written a book about him, Trump claimed he's unknown. Johnston has also suggested that Trump - who has posed as his own spokesman to steer press coverage in the past - might have leaked the pages. Given the lack of transparency over Trump's foreign ties and his blatant disregard for conflicts of interest, any insight into his finances should be welcomed. The leak's goal may be to distract from his administration's challenges, but it could also backfire by reminding Americans that the president broke convention by not publishing his tax returns - and got away with it. More importantly, it could spur further leaks. this red herring could prove to be just an appetiser.